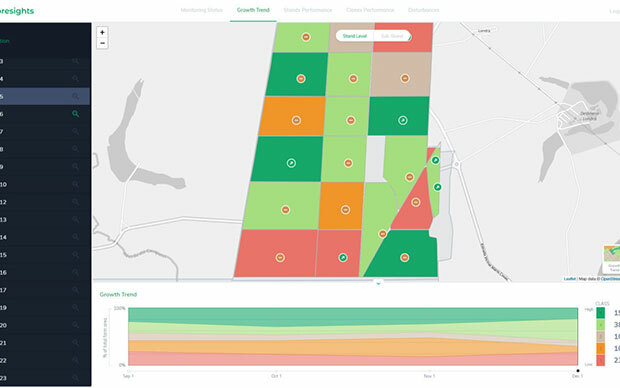 The startup PlanetWatchers has developed Foresights, a risk management and geospatial analytics platform designed specifically to help clients manage forestry assets quickly, effectively and accurately. Foresights identifies areas of new or potential risk, and delivers operations tracking and forest damage management services. The company plans to add satellite-driven analytics, inventory data and forest productivity services to the platform. before the end of the year. The Foresights platform covers larger geographic areas and delivers results faster and more accurately than traditional project-based companies, traditional inventory methods and off-the-shelf processing tools, the company said. PlanetWatchers combines multi-source satellite imagery data, topography maps, soil maps, meteorological data and near real-time ground input from operational teams to deliver optimized insights. The tool is capable of detecting disturbances as small as 0.1 ha (0.25 ac) related to pest, disease and drought damage. Reports identifying locations that require immediate mitigation can be viewed in existing GIS systems and are geolocated for forestry field teams, including offline capabilities for teams operating in remote areas without cellular reception. The Forest Operations service provides foresters with insights to track progress of various forest harvest operations such as thinning and clearcutting. This information assists operations managers in optimizing their wood supply chain and efficiently and effectively managing resources. The Forest Disturbance service delivers location-specific reports to forest owners and managers detailing areas with identifiable disturbances that could degrade the quality, yield, and profitability of forests. Some disturbances that Foresights can identify to help commercial foresters respond proactively include growth and uniformity issues over time, illegal logging, insect infestations and disease, competitive vegetation, storm damage, drought, wildfires and more. 1 Comment on "PlanetWatchers launches Foresights analytics platform for commercial forestry"